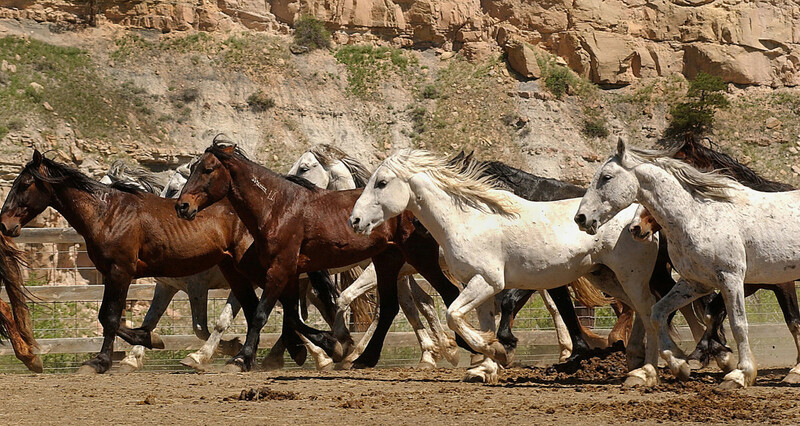 The Black Hills Wild Horse Sanctuary in South Dakota is opposing a proposed uranium mining project over environmental concerns. Let’s say you own 245 million acres. And underneath that land are billions of dollars’ worth of minerals – gold, silver, copper, uranium and more. Would you let foreign companies in to tear up your land, put your water at risk and take those minerals without paying royalties? You already are. That’s the amount of public surface land controlled by the U.S. Bureau of Land Management, the federal government’s biggest landholder. And companies that mine these lands are exempt from federal royalty payments. And it’s happening right now. Take, for example, the Dewey Burdock uranium project in South Dakota. It encompasses 240 acres of public surface land, plus more than 4,000 subsurface acres of uranium-rich earth. As of two months ago, a Hong Kong-based company had secured the right to mine and profit off that uranium, used to replenish nuclear power plants around the world, particularly in China. In November, Hong Kong’s Azarga Resources merged with Powertech to become Azarga Uranium and manage the Dewey Burdock project. Azarga will pay no royalties to the United States government. Thanks to the Mining Law of 1872, which still governs uranium and other “hardrock” mining to this day, any company can extract and sell minerals from public lands without paying a cent in royalties to the federal government. A spokesman for the mine, Mark Hollenbeck, points out that the mine will be paying South Dakota a severance tax, which is a tax on extracting nonrenewable resources. Besides the royalties issue, some community members worry this mine will put their drinking water at risk. In-situ uranium mining by nature takes place where there is groundwater. The process involves injecting chemicals into the aquifer where the uranium ore is. The chemicals leach the uranium from the rock, and the uranium is then pumped to the surface. 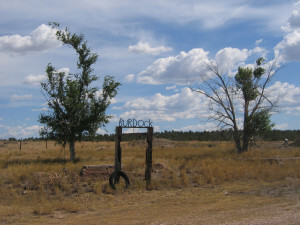 At Dewey Burdock, opponents are concerned that the radioactive, uranium-laden groundwater won’t be contained to the mining site. Last week, the Nuclear Regulatory Commission released testimony from geologist Hannan LaGarry. LaGarry found serious flaws in the company’s analysis of the groundwater geology. He concluded that that there is a risk of groundwater contamination if the mine is allowed to go forward. The mining company opposed the release of the testimony. In the U.S., the aquifer by law must be restored to its previous condition when mining is finished. That means the water must be cleaned enough to put it back to its pre-mining uses. A Hong Kong-based company has secured the right to mine and profit off the Dewey Burdock uranium project in South Dakota. In August 2013, the Rapid City Council unanimously voted to oppose the project. The proposal site sits on the southwest rim of the Black Hills at the South Dakota-Wyoming border. Other groups, such as the Clean Water Alliance, the Black Hills Wild Horse Sanctuary and tribal alliances also oppose the project. There are concerns about water quality, water quantity, Native American cultural preservation and effects on tourism – one of the state’s biggest industries. The Black Hills are home to Mount Rushmore, wild mustangs and the Black Hills National Forest. “We’re concerned tourists aren’t going to be excited being greeted by uranium mines and the water quality issues that go with them,” said Lilias Jarding of the Clean Water Alliance. The project has its permit from the Nuclear Regulatory Commission but it is still waiting on approval from the Bureau of Land Management as well as permits from the Environmental Protection Agency and state mining and water boards. So what is this 140-year-old law that allows foreign companies to make a profit off of resources owned by the collective American public? The Mining Law of 1872 is one of the more high-profile, outdated “lords of yesterday” policies created in a long-gone era of Western expansion that still govern our natural resources. This law sets out how people and companies prospect and mine for certain minerals on public lands. This law applies only to hardrock minerals – gold, silver, copper, iron, uranium and the like. It doesn’t apply to oil, gas and coal. When I say “public land,” I mean land that’s managed by the federal government. Mostly, it falls under the Bureau of Land Management or the U.S. Forest Service, but there’s a handful of other federal agencies that also manage public land. And a quick history: When the Gold Rush started, the government didn’t have much control over Western public lands. Prospectors would discover gold on public land but it wasn’t clear what their rights and responsibilities were. Most mining camps had self-governing bodies that allowed for unrestricted mining on public lands. But some in the East saw the miners as stealing public resources. Westerners fought back. They argued the miners were providing a public service by spurring economic and land development in the Wild West. Court rulings tended to side with the miners, and eventually the Mining Law of 1872 codified the right to explore and extract a range of minerals on public land. So what’s the controversy now? The law was written to encourage development when the West was still wild. You could hardly make the case that the West hasn’t been tamed. To put it another way: Hardrock-mining corporations that profit off of public resources don’t pay the government for the privilege to do so. Gas and oil companies, for comparison, do. They pay 12.5 percent royalties. In fact, the federal government made more than $11 billion from oil, gas and coal royalties in fiscal year 2011. Royalties are based on revenue from the extracted resource. We have only the vaguest idea of how much money the federal government is missing out on by not collecting royalties from hardrock mines. The feds don’t even collect data on how many tons of minerals are extracted from mines on public lands. A 2012 Government Accountability Office report attempted to pin this number down. It couldn’t. It nonetheless roughly estimated $6.4 billion in hardrock-mining profits from public lands. If the industry paid royalties comparable to oil and gas, hardrock royalty payments would be as high as $800 million. Typically, much more modest royalty rates of 4 to 8 percent are proposed. Using that, the Pew Campaign for Responsible Mining cites a conservative estimate of around $100 million in foregone royalties a year. A Democratic Party report last year, when a reform bill was in play, placed an estimate at $182 million. That 2014 reform bill proposed in the U.S. House of Representatives would have established a royalties system. The money collected would have gone to cleaning up waste at abandoned mines. But that bill, along with many similar bills from past congresses, failed, largely thanks to industry lobbying. The National Mining Association argues that the U.S. is the most expensive place in the world to mine. Imposing royalties would put U.S. miners at an economic disadvantage, say the association and mining executives. But the lack of royalties isn’t fair to taxpayers, especially when the federal budget is tight, said Autumn Hanna at Taxpayers for Common Sense. 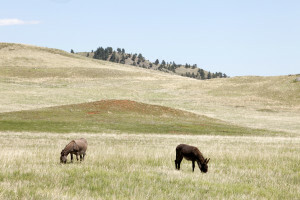 Donkeys graze in the Black Hills mountain range in South Dakota near the site of a proposed uranium mining project. For just 1 ounce of gold, a mine today can create 30 tons of waste rock. That’s because we don’t mine today like we did in 1872. Flakes of gold in streams are unheard of today. Now it’s all about wresting microscopic bits of dust from rock. This method, called “heap leaching,” uses dangerous chemicals – cyanide in the case of gold – and creates literally tons of waste. The writers of the 1872 mining law never imagined that. Acidic rivers that can’t sustain life, ponds filled with chemical waste and threats to biodiversity weren’t on their radar. And so, the 1872 mining law includes no environmental protections. Miners today have to comply with the Clean Water Act, Clean Air Act and other federal, state and local environmental laws. Even so, conservationists argue, those laws aren’t specific to the mining industry and don’t provide adequate protections. For example, a Bush-era change to the Clean Water Act actually made it easier to dump mine waste into streams. And the Resource Conservation and Recovery Act was amended to exclude mine waste from federal hazardous waste regulations. “The environmental laws we have right now are not really covering the damage done by the hardrock mine industry,” said Lauren Pagel, policy director for the nonprofit environmental group Earthworks. Another major concern is that the government pretty much can’t say no to a claim application. The “right to mine” is a long-standing interpretation of the 1872 law, meaning that as long as you pay your fees, you have the right to mine on that land. (Certain areas, including national parks and wilderness refuges, are off-limits, though). The idea behind this is that public land should be put to the “highest and best use.” Long ago, the Bureau of Land Management established a precedent that mining is just that. That means a mining company can mine where it wants, when it wants, regardless of whether or not it’s near a sensitive environmental area. Another missing protection for more than 100 years was reclamation. Companies could simply walk away from their mine when it stopped being profitable. There was no requirement to clean up after themselves or reclaim the land. By the early 1980s, new requirements were put into place to prevent that. Nonetheless, there are more than 500,000 abandoned mines on public lands today, some of which pose serious environmental threats. Designed to spur development in the American West of the 19th century, these laws still govern our natural resources in the 21st. Nowadays, long after the taming of the West, they contribute to environmental degradation, favor corporate special interests and cost the government and taxpayers hundreds of millions, if not billions. Take, for example, the case of Cortez Mine in Nevada, one of the biggest gold mines in the U.S. Owned by Canada’s Barrick Gold, it produced 1.3 million ounces of gold in 2013. With gold averaging $1,400 an ounce that year, that’s a value of more than $1.8 billion. It paid nothing in royalties to the federal government. That’s because gold mining is covered by this 1872 mining law. It was originally supposed to make it easier for the “go West, young man” adventurer who trekked across the Rockies with little more than his canvas tent, a shovel and a pick. But today, CEOs and giant earthmovers have replaced him and his sluice box. We’re launching a reporting campaign digging into the legacies of these lords of yesterday. I’ll be looking at mining, grazing and water issues, focusing in particular on how certain legacy laws and policies allow private interests to make a profit off public resources at the expense of the taxpayers and the environment. Archaic laws allow ranchers to graze their sheep and cattle in national forests and on other public land for cheap and allow big farms to get subsidized water, even in times of drought. Remember last year’s armed standoff between Nevada rancher Cliven Bundy and federal employees? The Bureau of Land Management was coming to impound his cattle because Bundy hadn’t paid (way-below-market-rate) fees for grazing his livestock on public land in decades. Bundy’s belief that he has a right to graze on public lands unbothered and unregulated – and the government’s decision to back off and let him – are also holdovers from the 19th century rise of the West. Stick with us as we explore the consequences of these outdated policies and figure out why they’re still around today. If you have a personal experience or thoughts about how archaic natural resource policies affect us today, email me at rbale@cironline.org. This story was edited by Robert Salladay and copy edited by Stephanie Rice. Rachael Bale can be reached at rbale@revealnews.org. Follow her on Twitter: @Rachael_Bale. This law applies only to hardrock minerals – gold, silver, copper, iron, uranium and the like. It doesn’t apply to oil, gas and coal. When I say “public land,” I mean land that’s managed by the federal government. Mostly, it falls under the Bureau of Land Management or the U.S. Forest Service, but there’s a handful of other federal agencies that also manage public land. No environmental protections Donkeys graze in the Black Hills mountain range in South Dakota near the site of a proposed uranium mining project.